Optimal quality and up-to-date design have always been the principles behind Scheffel-Schmuck. Ever since 1976 we have been following clear goals. No mass-produced products in the luxury sector, just individuality and recognition value. It’s the new ideas, the right feel for current events and the perfect execution that make Scheffel jewellery what it is. 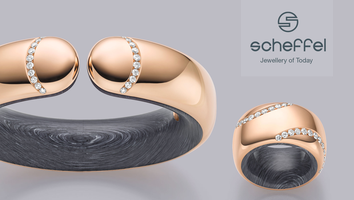 Precious wood, ivory-like Elforyn or Juma Gem in different colours - special materials combined with gold, brilliant cut diamonds and superior gemstones characterize the collections of Scheffel. Latest production-technologies like Stretch and a high degree of craftsmanship fulfil our exeptional standards. Our design icon is getting an update with stretch technology. Bubbles stretch is current, comfortable and with the times. Simply slipped onto the wrist, the bracelets sit securely and casually. A flexible luxury that women value and love. Soft-looking shapes in gold share the limelight with dazzling lines. The distinctive design can be seen throughout the collection. The bracelet comfortably brushes against the wrist, its flexibility ensuring a secure fit. Simply strapped across the arm, the flexible bracelets fit securely on your arm all day long. The collection’s rings are just as comfortable to wear. Thanks to an internal mechanism, they adapt perfectly to the situation as well as to the wearer’s finger. The soft-look, freely-moving tassels appear to conflict with the clear-cut, modern Kashmir design. This is the very concept of the collection: contradictions that are in harmony and that complement each other. Sporty, elegant - perfect for every occasion. The encounter of materials of different composition, character and vibrancy gives this collection its allure. Cold, smooth metal caresses warm, grained wood. Jewellery which is outstanding due to its contrasts, its unique grace and haptic. Organic, smooth and feminine. It’s the soft and distinct lines that give our jewellery its unmistakeable identity. This completely new look is crafted entirely from rose gold and set with perfectly cut diamonds.